But the conclusion is based far more on wishful thinking than on any scientific evidence. The opening line of the article was amended within a week of being posted to include the words “of variable quality”. The problem isn’t that the studies are of “variable quality”. The problem is that the vast majority of them are not about certification at all. First, let’s look at the Mongabay article, which was written by Shreya Dasgupta, based on research by Zuzana Burivalova. Then we’ll look in detail at the literature review that Burivalova carried out. The Mongabay article found that there wasn’t enough evidence to say whether certifying tropical forestry operations is good for the people living in and near the forests, or whether certified logging companies make bigger profits. This post looks specifically at the claim that FSC-certified logging operations are better for the environment than forests managed conventionally. Enter FSC. Although FSC isn’t mentioned in the headline, or the opening sentence, the article is about FSC. FSC is mentioned 81 times in the article. No other certification scheme is mentioned. According to Dasgupta, FSC “hopes to change the way forests are managed”. Rather than judging FSC on whether it has succeeded in changing the way forests are managed in its 24 years of existence, Dasgupta tells us what FSC “hopes” to achieve at some non-specified point in the future. Dasgupta gives a description of FSC, included a quotation from Corey Brinkema, the president of FSC-US. Brinkema gives us his un-biased opinion that FSC is the “single-best tool that exists today to conserve tropical forests”. And then there’s a quotation from WWF, an organisation not known for its impartial views on FSC. Followed by a gushing comment from Catharine Grant of Greenpeace. Dasgupta did not interview any critics of FSC. Neither did she mention the fact that several NGOs have resigned their FSC membership, after years of trying unsuccessfully to reform FSC. To find out, Dasgupta and Burivalova “reviewed 40 studies that looked at the impacts of forest certification and talked to six experts”. Dasgupta acknowledges that “The scientific literature on FSC certification’s impacts is currently poor.” There are few studies. Many are “biased by design”. Or they “lack methodological rigor to prove causation”. “Even though the FSC has been around for nearly 25 years,” Dasgupta writes, “we found no studies that had looked at the long-term impacts of FSC certification”. To build our evidence base, we targeted rigorously designed studies that specifically compared two different forest management regimes: certified logging forests with non-certified, conventionally logged forests in the tropics. However, we could find only 13 studies that fit our criteria, so we also included 27 studies that compared the effects of managing a forest under Reduced Impact Logging (RIL) standards with those of managing a forest conventionally. This is because almost all FSC-certified timber forests use RIL standards — a set of logging guidelines that experts believe leads to much lower damage in timber concessions. As Simon Counsell, Executive Director of Rainforest Foundation UK, a founding member of FSC, and a co-founder of FSC-Watch, points out in a comment following the article on Mongabay, there is a methodological error in Burivalova’s research. The studies on reduced impact logging were included based on the assumption that “almost all FSC-certified timber forests use RIL standards”. Or that the RIL practiced by FSC-certified companies is the same as in those in the reviewed RIL studies? Dr Burivalova creates a tautology by assuming that FSC certified companies use RIL, then finding that RIL reduces forest damage, and then concluding that FSC certification reduces damage. Most of the logging operations covered by the RIL studies were not FSC certified. No evidence is adduced that FSC certified operations do consistently adhere to RIL. Burivalova responded to Counsell’s comment with a promise of adding “an explanatory textbox to this article, to avoid any further misunderstandings”. But instead of a textbox, the article was edited in a way that promotes further misunderstandings. Or as Mongabay puts it, to “clarify the methodology used”. To build our evidence base, we targeted rigorously designed studies that specifically compared two different forest management regimes: certified logging forests with non-certified, conventionally logged forests in the tropics. However, wWe could find only 13 studies that fit our criteria, s. So we also included 27 studies that compared the effects of managing a forest under Reduced Impact Logging (RIL) standards with those of managing a forest conventionally. This is because almost all According to several scientific studies and communication with a number of experts, most FSC-certified forests appear to use RIL — (a set of logging guidelines that experts believe leads to much lower damage in timber concessions). Dasgupta and Burivalova’s previous statement that “almost all FSC-certified forests use RIL” is gone. Instead, they refer to “several scientific studies” and “a number of experts”. Which scientific studies? Which experts? Dasgupta and Burivalova don’t tell us. A “measure of uncertainty”? Indeed. Read on for more. The Mongabay article features a photograph of a logging road cutting through a forest in Borneo. 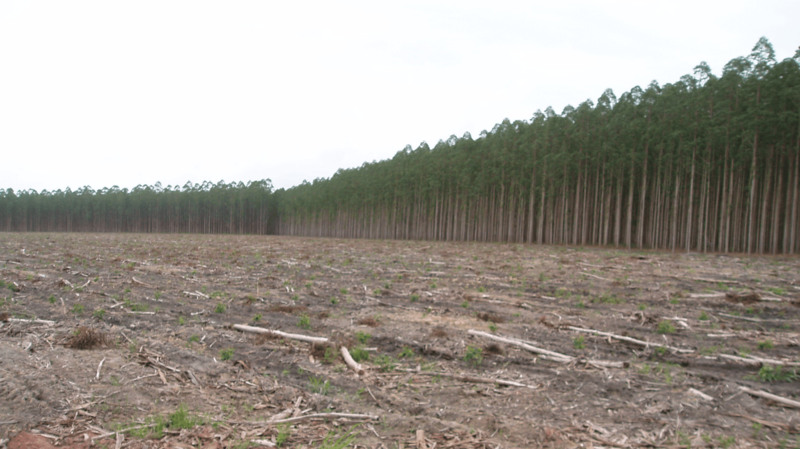 Just for balance, here’s a photograph of an FSC-certified operation: Veracel’s industrial tree monocultures in Brazil. Reduced impact logging, anyone? [I]n the infographic, we give readers the option to look at all evidence (RIL, FSC, weak, strong, meta, direct, indirect, …) as well as only subsets of the evidence. Whereas there is not a specific checkbox for seeing just RIL or just FSC, you can try selecting “Study III (Controls selected rigorously)” in the drop down menu “Type of evidence”. All of these data points come from (2) studies which both rigorously measured the impact of the FSC. Mongabay provides a list of the 40 studies. FSC-Watch took up Burivalova’s offer of looking at all the evidence. In fact, Desgupta and Burivalova refer to 28 studies (listed below) to back up their claim that FSC-certification is good for the environment. 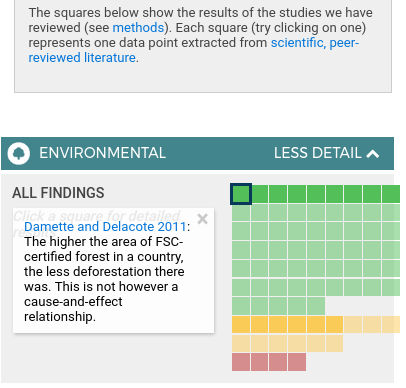 I clicked on each of the squares under Environmental on the infographic – in total there were 28 studies referred to. Burivalova claims to use “scientific, peer-reviewed literature” for the literature review. But of the 28 studies, six are not peer-reviewed studies, and should therefore be excluded from the list. Of the peer-reviewed studies, ten make no mention of certification, and should therefore be excluded from the list. Another two should also be excluded: Barreto et al. (1998) mentions certification only twice, in passing. The paper is a cost benefit analysis of using “best” logging practices, compared to conventional logging; and Bertault and Sist (1997) was based on work carried out from November 1991 and May 1992 – before FSC was launched. Romero, C., Sills, E.O., Guariguata, M.R., Cerutti, P.O., Lescuyer, G., Putz, F.E. (2017). Evaluation of the impacts of Forest Stewardship Council (FSC) certification of natural forest management in the tropics: a rigorous approach to assessment of a complex conservation intervention. Int. For. Rev. 19(S2). More than 1,500 forestry operations are FSC-certified, covering a total area of almost 200 million hectares. About 16% of this area, or 32 million hectares, is in the tropics. Clearly 10 studies is inadequate to reach any general conclusions about the impact of FSC-certification on the environment in the tropics. Here are the 10 peer-reviewed studies in Desgupta and Burivalova’s list that actually mention certification, followed by the 18 studies that should not have been in the list. Desgupta and Burivalova: There was more shifting agriculture in the certified concessions compared to conventional concessions, but this difference was not significant. There was more hunting and Non Timber Forest Product gathering in the conventional concessions than in certified ones, but the difference was not significant. (3) the latter’s rights and customary uses. Desgupta and Burivalova: Species richness in Reduced Impact Logging concessions is higher than in conventional logging concessions. Bird species richness in Reduced Impact Logging concessions was marginally higher than in conventional logging concessions. Arthropod species richness in Reduced Impact Logging concessions was higher than in conventional logging concessions. Plant species richness in Reduced Impact Logging concessions was higher than in conventional logging concessions. Mammal species richness in Reduced Impact Logging concessions was about the same as in conventional logging concessions. FSC-Watch: This report ranks forest management types in terms of local species richness. The paper only mentions certification once, in relation to clearcuts in temperate and boreal forests (and certification is mentioned in two of the references). Note that second to worst is timber plantations. FSC has certified vast areas of plantations, including industrial tree plantations that have serious impacts on local communities and their environment. Desgupta and Burivalova: The higher the area of FSC-certified forest in a country, the less deforestation there was. This is not however a cause-and-effect relationship. FSC-Watch: This paper asks the following questions: Is forest harvesting related to deforestation? Are timber products a by-product of deforestation? Do countries with more important forest sectors experience more deforestation than others? Does timber certification play a key role in favoring sustainable harvesting? The authors conclude that, “timber certification is negatively related to deforestation and thus seems to be a good indicator of harvesting sustainability”. Desgupta and Burivalova: Even when logging intensity differences were taken into account, ground disturbance was lower under Reduced Impact Logging and forest certification, compared to conventional logging. FSC-Watch: This paper is about a logging concession run by Rohden Indústria Lı́gnea Ltda. Rohden Indústria was certified under the FSC system in 2003. Does it matter that the certification was terminated in 2013? Apparently not to Desgupta and Burivalova. FSC-Watch invites readers to look at the various corrective action requests over the years, and reach your own conclusions about whether FSC really “works”. Major CAR 2008.03: Rohden does not have na [sic] updated version of the Forest Management Plan. The general description is superficial. CAR 2008.11: No assessment was presented of social and environmental impacts generated by management activities developed in the last 29 years in Juruena region. CAR 2009.02: There was no evidence of employee (manager and technical staff) retraining program on RIH (Reduced Impact Harvesting) technique, chain of custody, and monitoring, in order to improve its forest management. Of course, had Rohden Indústria conformed to these corrective action requests, there may be an argument that FSC is working. The reality, however, is that Rohden Indústria is no longer certified – presumably because it failed to meet these corrective action requests. FSC’s website does not give any information about why Rohden Indústria is no longer FSC certified. Desgupta and Burivalova: Canopy loss was higher under conventional logging, compared to Reduced Impact Logging. Less ground area was disturbed under Reduced Impact Logging compared to conventional logging. Combined with less damage to the residual stand and soils, RIL methods set the standard for timber certification initiatives. Research concerning market development for certified wood products from tropical forests would help advance the cause of sustainable forest management in forest regions otherwise subject to ecological degradation. The study looks at reduced impact logging in Fazenda Cauaxi and surrounding areas in the Paragominas Municipality of Pará State, Brazil – the same area of forest that Asner et al (2004) studied. Desgupta and Burivalova: There was a significantly higher species richness of large bodies mammals in certified concession compared to conventional logging concessions. Higher carbon density in above-ground vegetation can be attributed to sustainable forest management in certified concession. Conservation areas (where no logging happens) were established in certified concessions but not in conventional logging concessions. FSC-Watch: This paper estimated the diversity of medium to large forest-dwelling vertebrates in sustainably managed forest and conventionally logged operations. Deramakot was certified by Forest Stewardship Council in 1997 for its well management. The paper looks at two sites in Sabah: Deramakot (FSC-certified); and Tangkulap (“damaged by conventional logging at the time of investigation”, 2001 – 2007). Desgupta and Burivalova: Significantly less biomass was converted to necromass in the certified concession, compared to conventionally logged concession. Significantly fewer trees were destroyed per tree extracted in the certified concession compared to conventionally logged concession. Less above-ground biomass destroyed in the certified concession, compared to conventionally logged concession. Even though per tree extracted, there was not a significant difference in all measures of road and skid trail density employed, overall, there were fewer and narrower skid trails and roads in the certified concession, compared to the conventionally logged concession. Difference in felling gap size per tree harvested was not significant between certified and conventional concession. Before and after logging comparison of CL and FSC showed very little change in tree species density in both concessions, and there was no significant difference in the change. Based on these findings and in light of the pseudo replicated study design with less-than perfect counterfactual, we cautiously conclude that certification yields environmental benefits even after accounting for differences in logging intensities. this is a non-replicated study of an intervention that was not assigned at random. A further deficiency in our experimental approach is that by treating sample plots in the two concessions as replicates, we are guilty of pseudo replication. We also lack an unlogged control area and thus must assume that any changes in the logged stands are the result of the logging treatments to which they were subjected. Logging intensity at the uncertified site was nearly twice that at the certified site, and therefore, the total impacts on AGB [above ground biomass] were also generally higher when expressed on a per hectare basis. Lower logging intensity in the FSC-certified concession was apparently related to the company’s response to the 2010 log export ban as well as to the lower stocking of A. klaineana [Aucoumea klaineana] and was not due to implementation of RIL techniques or compliance with certification standards. Nevertheless, the authors found that FSC certified concession did have smaller impacts from tree skidding and road-building. Desgupta and Burivalova: FSC certification caused a 4.97% reduction in deforestation in certified villages. FSC certification did not lead to a reduction in water pollution. FSC certification did not lead to a change in fire occurrence. Using data from 2000–2008 in Kalimantan, we find that FSC certification significantly reduced deforestation by 5 percentage points and air pollution by 31% compared to the matched control villages in non-certified logging concessions. This suggests that the program may address previous concerns about the ineffectiveness of traditional logging concessions in reducing deforestation and their potential to decrease community welfare by limiting access to forest resources. However, while FSC certification improves some environmental and socio-economic outcomes, the program may introduce disturbances in forest ecosystems (e.g., by opening the canopy). The authors note that the current design of the FSC programme does not require detailed data collection. It is perhaps surprising that Dasgupta and Burivalova don’t consider this worth mentioning in their Mongabay article. [W]e call for structural changes that make more and better data collection an integral part of the program implementation; this would facilitate evaluation of their effectiveness and long-term impacts, and, thus, improve conservation outcomes. Desgupta and Burivalova: Canopy damage was lower in Reduced Impact Logging cutting blocks compared to conventional logging blocks, even when differences in harvest intensity were controlled for. There were fewer trees destroyed in Reduced Impact Logging cutting blocks compared to conventional logging blocks, even when differences in harvest intensity were controlled for. Damage due to skidding was lower in Reduced Impact Logging cutting blocks compared to conventional logging blocks, even when differences in harvest intensity were controlled for. There was about the same number of trees injured in Reduced Impact Logging and conventional logging cutting blocks, when differences in harvest intensity were controlled for. Under higher logging intensities, collateral damage was about the same in Reduced Impact Logging and conventional logging cutting blocks. Based on these new results and previous studies in Borneo, we suggest three silvicultural rules: (1) to keep a minimum distance between stumps of ca. 40 m, (2) to ensure only single tree gaps using directional felling, (3) to harvest only stems with 60–100 cm dbh. Foresters, policy makers and certifiers should consider these as criteria for sustainable forest management. This study then has allowed us to reassess and lend support to the general proposition that RIL techniques must be implemented within a reasonable intensity threshold, and that this boundary lies at around 8 trees/ha in hill dipterocarp forests. Foresters, managers and certifiers must now consider this threshold as an important criterion of sustainability. Desgupta and Burivalova: There was a higher number of mammal species per 200x200m cell in the certified concession compared to the conventionally logged concession. The authors interpret this difference as small. More mammal species overall, and more threatened mammal species had a higher abundance in the certified logging concession than in the conventionally logged one. Those species that had a lower abundance in certified concession were mostly classified as Least Concern by the IUCN. Above-ground biomass was higher in the FSC certified concession than in conventionally logged concession. FSC-Watch: This paper is about mammal biodiversity in one FSC-certified logging operation, Deramakot Forest Reserve (55,000 hectares); another that was FSC-certified after the study was completed, Tangkulap Forest Reserve (27,600 hectares); and one MTCS-certified logging operation, Segaliud Lokan Forest Reserve (57,200 hectares). Desgupta and Burivalova: There was lower canopy damage per tree harvested under Reduced Impact Logging compared to conventional logging concession. The percentage of forest area that was occuppied [sic] by roads, decks, and skidding areas was lower in Reduced Impact Logging harvest blocks compared to conventionally logged blocks. FSC-Watch: This paper combined field study and satellite imagery to assess the dynamics of canopy damage following selective logging in Paragominas Municipality of Pará State, Brazil. The paper makes no mention of certification. Desgupta and Burivalova: There was less canopy loss under Reduced Impact Logging compared to conventional logging. Canopy loss lower under Reduced Impact Logging compared to conventional logging. Gap size lower under Reduced Impact Logging compared to conventional logging. There were fewer damaged trees under Reduced Impact Logging compared to conventional logging. FSC-Watch: As you can see, Desgupta and Burivalova repeat each of the findings of this paper. Instead of four pale green squares on the Infographic, this paper adds eight pale green squares – each one supposedly indicating “weaker evidence” that certified logging operations are better than conventional. This paper actually looks at “the technical feasibility, efficiency and profitability of ‘best’ logging practices in this region by comparing planned and unplanned logging operations in side-by-side plots”. It also looks at the medium-term economic performance of ‘best’ forestry practices. If lifting the ban on log exports were to have the desired effect of stimulating forest management among rural land owners (as opposed to stimulating rapid extraction of valuable species), it would be necessary to strictly limit log exportation to logs taken from management projects that were certified in sustainable production. Such ‘green’ certification could also allow access to ‘green wood’ markets where prices are generally higher than those paid for traditionally produced tropical hardwoods. Desgupta and Burivalova: The tree injury rate in [sic] was lower in Reduced Impact Logging cutting blocks compared to conventionally logged blocks, even when adjusted for logging intensity differences. There was less skidding damage in Reduced Impact Logging cutting blocks, when compared to conventionally logged blocks, even when adjusted for logging intensity differences. FSC-Watch: This paper compares reduced impact logging with conventional logging in East Kalimantan, Indonesia. The paper was based on work carried out from November 1991 and May 1992. Before FSC was launched in other words. Desgupta and Burivalova: There were smaller shifts in animal abundance under Reduced Impact Logging, compared to conventional logging. Desgupta and Burivalova: The results offer no evidence that FSC certification affects deforestation. FSC-Watch: This is a 48-page “discussion paper” put out by Resources for the Future, a think tank based in Washington DC. It’s a nice touch to list the publication as Resour. Futur., but this is not scientific, peer-reviewed literature. Desgupta and Burivalova: Changes (both positive and negative) in bird abundance were lower in forests that had been logged under Reduced Impact Logging, compared to conventional logging. Desgupta and Burivalova: The diversity and species richness of dung beetles was higher in Reduced Impact Logging cutting blocks compared to conventionally logged blocks. The number of forest specialist species of dung beetles was higher in Reduced Impact Logging cutting blocks compared to conventionally logged blocks. FSC-Watch: This paper looks at the differences in dung beetle community structure in two logging sites in the Ulu Segama Reserve in southeastern Sabah, Malaysia. Both sites were logged in 1993, one using reduced impact logging and one using conventional logging. The paper makes no mention of certification. Desgupta and Burivalova: There were fewer damaged trees under Reduced Impact Logging compared to conventional logging. Canopy loss was higher under Reduced Impact Logging compared to conventional logging. Canopy gap size was larger under Reduced Impact Logging compared to conventional logging. FSC-Watch: This is not scientific, peer-reviewed literature. This 353-page report, published by Tropenbos-Guyana, is a Utrecht University PhD thesis about reduced impact logging in Guyana. The word certification is mentioned only once in the text, and in one of the references. Desgupta and Burivalova: Residual tree damage was lower under Reduced Impact Logging compared to conventional logging. Effect of Reduced Impact Logging on above ground biomass was not discernable when compared to conventional logging. Mostly the differences in above ground biomass were due to the differences in logging intensity. Tree species richness was only impacted by logging intensity, not by Reduced Impact Logging. Montenegro, F. (1996). Extraccion Forestal de Bajo Impacto en La Mayronga. Fundacion Forestal Juan Manuel Durini/ITTO, Quito, Ecuador. Data in English here. Desgupta and Burivalova: Less ground area was disturbed under Reduced Impact Logging compared to conventional logging. FSC-Watch: This report, published by Fundación Forestal Juan Manuel Durini and ITTO, is about reduced impact logging in La Mayronga, Ecuador. This is the only one of Desgupta and Burivalova’s references that I could not track down. The link given for the data in English goes to a completely different paper. In any case, this is not scientific, peer-reviewed literature. Desgupta and Burivalova: Vine cutting, which is a practice that is typically part of Reduced Impact Logging, did not significantly change the level of collateral damage. FSC-Watch: This paper reports on an experiment in southern Cameroon “to test whether pre-felling climber cutting could reduce logging damage”. The paper makes no mention of certification. Desgupta and Burivalova: Taking the number of trees felled into account, there was less canopy loss in Reduced Impact Logging concession, compared to conventional logging concession. Taking the number of trees felled into account, there was less ground disturbance in the Reduced Impact Logging concession, compared to conventional logging concession. At our study sites, both ground and canopy damage were greater at conventionally logged sites than at RIL sites. Disturbance in conventionally logged blocks was generally twice as severe on an area or gap fraction basis than in RIL blocks. Desgupta and Burivalova: Percentage of biomass loss was lower in Reduced Impact Logging concession compared to conventional logging concession. Controlling for logging instensity, collateral damage was lower in Reduced Impact Logging concession compared to conventional logging concession. FSC-Watch: This paper compares “dipterocarp forests logged according to reduced-impact logging guidelines with forests logged by conventional methods in terms of the above- and below-ground biomass both before and after logging”. The paper makes no mention of certification. The paper looks at “A pilot carbon offset project” set up in Sabah, Malaysia, in 1992. Under the carbon offset deal, a power company funded the Innoprise Corporation to carry out reduced impact logging, so that the power company could buy carbon credits in order to continue polluting. Pinard, M. a, Putz, F.E. & Tay, J. (2000). Lessons learned from the implementation of reduced-impact logging in hilly terrain in Sabah, Malaysia. Int. For. Rev. Desgupta and Burivalova: Proportion of basal area killed relative to timber extracted was lower in Reduced Impact Logging concession, compared to conventional logging concession, even when differences in logging intensity were controlled for. Percentage of uprooted and crushed trees and snapped crown was lower in Reduced Impact Logging concession compared to conventional logging concession. Area of soil damaged and disturbance to top soils was lower in Reduced Impact Logging concession compared to conventional logging concession. FSC-Watch: This paper is about a carbon offset reduced impact logging project in Sabah Malaysia. The paper makes no mention of certification. Between 1992 and 1997, the Innoprise Corporation logged a total of 2,400 hectares at three sites in Ulu Segama, Kalabakan, and Gunung Rara. The authors write that, “By reducing incidental tree mortality, less biomass would be lost from the forest, carbon emissions from decaying debris would be reduced, and the capacity of the forest to sequester carbon would be maintained”. Desgupta and Burivalova: Above ground biomass was higher 2 years after logging in Reduced Impact Logging concession compared to conventional logging concession. Root biomass was higher 2 years after logging in Reduced Impact Logging concession compared to conventional logging concession. Soil carbon was higher 2 years after logging in Reduced Impact Logging concession compared to conventional logging concession. Necromass was lower 2 years after logging in Reduced Impact Logging concession compared to conventional logging concession. FSC-Watch: This paper argues that reduced impact logging results in lower carbon emissions than conventional logging and can therefore be used to generate carbon offsets. The paper makes no mention of certification. It’s another paper about the Innoprise Corporation’s project in Sabah. Desgupta and Burivalova: There was less canopy loss, and less damage after certification was implemented. FSC-Watch: This is a 148-page report about financial cost-benefit analysis of forest certification, published by the ITTO. Certification and FSC are mentioned frequently throughout the report, but this is not scientific, peer-reviewed literature. The report includes five case studies of certified operations: Inpacel (plantation, CERFLOR, Brazil); Cikel (logging, FSC, Brazil); PT Diamond Raya Timber (logging, LEI and FSC, Indonesia); KPKKT (logging, MTCC, and FSC underway, Malaysia); Perak ITC (logging, FSC, Malaysia); Deramakot Model Forest (logging, FSC, Malaysia). Desgupta and Burivalova: Under Reduced Impact Logging, 21% or original stems were damaged, compared to 44% under conventional logging. Under conventional logging, roads and skid trails were longer and covered more area, log landings and bladed surface was larger, compared to under Reduced Impact Logging. Steep slopes and buffers were set aside under Reduced Impact Logging, whereas this was not the case under conventional logging. FSC-Watch: This paper, published by FAO as conference proceedings is not scientific, peer-reviewed literature. The authors carry out a financial assessment of reduced impact logging at the Innoprise Corporation’s carbon offset project in Sabah, Malaysia. This is the fourth study in Burivalova’s list that uses findings from the Innoprise Corporation’s carbon offset project in Sabah, Malaysia. Desgupta and Burivalova: Canopy loss was higher in conventional logging concession compared to Reduced Impact Logging concession. The ground area disturbed was lower in Reduced Impact Logging concession, compared to conventional logging concession. The gap size was higher in Reduced Impact Logging concession compared to conventional logging concession. There were fewer damaged trees in conventional logging concession compared to Reduced Impact Logging concessions. FSC-Watch: This report is a case study of Precious Woods Ltd’s logging operations in the Amazon. The company has been FSC certified since June 1997. However, the FAO report makes no mention of certification. In 1995, the UN Food and Agriculture Organisation developed a “Model Code of Forest Harvesting Practice”. FAO’s report looks in detail at how Precious Woods applied the Model Code, and the impact on the forest compared to conventional logging. This is a report published by the FAO. It is not scientific, peer-reviewed literature. A mix means at least 70 percent of the wood in a product comes from FSC-certified or recycled material; while 30 percent is made of uncertified wood. But here comes the catch, we work in a ‘credit’ system. Meaning for example say we buy 70 tons of FSC paper and 30 tons uncertified paper, that gives us credit to make 100 tons of FSC mix. But this doesn’t mean that if you buy a kitchenroll with FSC mix that the pulp inside is 70/30 equally mixed. No we split them into products with 100% FSC paper and 100% Uncertified paper or else we get too much of variation in pulp fibers in the process. thank you very much for checking sources for the mongabey article. Personally I find this very useful and I do expect that FSC can improve itself to provide credible guarantee of sustainable forest management.